While the most common way to do touristy things in Ethiopia is in form of a packaged all-inclusive tour, you can trek Simien more or less independently. We did a self-organized three night hike from Debark to Chennek with overnight stops at Sankeber, Geech and Chennek. While it was challenging, it was in a way more satisfying than the Danakil tour we had done with an agency. This post describes our experience and provides tips on how to organize a trek yourself. The prices and other information are as of January 2016. When in Debark, head straight to the park office. It is located about 1km south (the Gonder direction) from Uniq Land Scap Hotel (sic!). On your way there you will be harrassed by touts offering their services. Ignore them. We were even approached by touts in the yard of the park office, who pretended to be park office staff and offered to organize a trek for the modest $450. Only when inside the building you can be sure that you talk with the real park office staff. You will have to organize the following things: entourage/park fees, equipment, food and transportation. The whole process took us about two hours and a fair bit of walking, so it is better to arrive early. The official fees as of January 2016 can be found in the following image. You will have a choice of hiring a scout, a guide, a cook and mules. Scout is mandatory, everybody else is optional. We managed with a scout, a mule-man and one mule. While guides insist that their service is necessary and scouts are “ignorant and confused”, you can do just fine without a guide. In fact most guided groups we have met said that a guide was useless apart from his English skills. Scouts do not speak any English, but they know the way just fine and are as good at showing points of interest. Having no common language also added to the excitement factor. Although at times it would have been nice to know how much walking was left. Hiring a mule is something you probably want to do, unless you want to carry a heavy backpack in mountainous landscape and thin air. Each mule is able to carry upto 45kg, which more than enough for two backpacks, kitchen gear and food. If you hire two or three mules, that will require two mule-men. Note that for the most part of the journey you will walk away from the mule and your stuff, so pack your daypack with everything you would need during the day (at least water, lunch and warm clothes for cloudy weather). A hired cook will free up your time in mornings and evenings, but otherwise you can do without one. We managed without a cook just fine, although rented kitchen equipment turned out to be a hassle (more info on that in the next section). On a bright side, cooks from other groups were very helpful and seemed to respect our decision to trek independently. We had our own tent, sleeping bags and sleeping mats, but if you lack any of those you can rent camping equipment at the park office. Reports from other people suggested that rented equipment is subpar, but you can always choose an option to sleep at lodges, which are reported to be warm (and apparently no flees contrary to older reports). It gets very cold out there with night temperatures dropping below zero, so choose your equipment accordingly. If you hire a mule, you will need plastic sacks and a rope for your stuff. Supermarkets sell sacks for a 10 birr a piece, while a helpful man on the street sold them for a 20 birr a piece. We were told that sacks were of different quality, but that remained to be seen. Note that sacks are prized possessions in the mountains, so cherish them and consider donating them to your muleman / scout after the trek. Kitchen equipment can be rented from a green shop some 100m away from the Unique Land Scap hotel on the other side of the street. We paid 100birr a day for a stove, a pot, a frying pan, a kettle, a fork and a spoon. Kerosine was 30birr/liter. We bought two liters, which was more than enough. Most of the kitchen gear was beaten up, but did the job. The kerosine stove, on the other hand, was a total failure. A glorified kerosine lamp, which was messy, half broken and very slow. I ended up fixing it every day, as it didn’t stay in one piece. Nor I ever managed to get the flame adjusting mechanism working. I would recommend bringing your own stove instead. If it’s not possible, at least ask the shop personnel to show how the stove works and verify it working. Selection at Debark supermarkets is limited and prices seemed to be inflated, hence it is a good idea to stock elsewhere. In Debark you will do your shopping from a supermarket (water, oil, porridge, rice, pasta, canned meat and tuna, jam, sugar etc), a bakery (bread) and a market (vegetables and fruits). It was challenging to find all the places, but park office can send someone to help you with shopping (a tip is expected). Park office personnel claimed buying food on your own would be more expensive than with help from a local guy. Food shopping turned out pretty expensive by local standards anyway, so it is hard to say if it makes any difference. Another option is that park office staff would do shopping for you. They give us a quote of 1500birr for kitchen gear and 1000 birr for food. We did it ourselves and paid 500birr for the gear and 700 birr for food. Some words should be said about feeding your entourage. At the park office they said that the scout and the mule-man would provide for themselves. The reality was different, though. The scout ate once a day at quick stops at villages and hardly drank any water. Never saw the mule-man drinking or eating anything, but he spent most part of the day away from us. Then again, when we offered food to them, they both accepted it gladly. Furthermore, a guide from another group told us that independent treks are hard for scouts, which seemed to be true as scouts from tour treks ate with the rest of the group. So stock and cook some extra to keep everybody happy. The official way to get around the park is a hired taxi from the park office, but it is crazy expensive by any standards. For example, a ride from Debark to Chennek or vice versa is quoted at 2400 birr! To add to the insult we were told it was the only option getting out of the park. There are other ways, though. In the beginning of the trek you have an option of walking the whole way from Debark to the first camp. This is what we did. The walking distance from Debark to Sankaber is 25km and was a bit too intense, especially with the initial ascent of 500m before the park entrance. The scenery is beautiful all the way, but the effort is probably not worth it. A more appealing alternative is a tuk-tuk to the park entrance that would shave off some 10km of walking and 500m of ascent. We were quoted 250birr for this ride, but the price can probably be shot down if arranged in advance. Getting out of the park can be arranged on the spot in Chennek (and probably in other camps as well). First, there is a local bus (70birr or so, plus a likely baggage fee). The bus officially leaves at 7AM from Chennek, but in reality it showed up around 8:30AM. Some guides claimed that tourists are not allowed to take the bus, while others claimed the bus was usually full (indeed, it appeared crowded), but you can most likely secure your seat by paying a faranji fee. Second, there are always tour company cars leaving. So ask around (or more likely they will find you) and you get your ride. We paid 1000birr / two persons for a ride to Gonder with a private minibus, which seemed to be an ok price considering the circumstances. The third option is hitch-hicking, either in a private car or a truck. Any car will gladly take you on board as long as you pay. One driver offered us a ride to Debark for 500birr / two persons. Prices for trucks are not known to me. Do not underestimate the coldness of the mountains. Days are hot, while the sun is shining, but winds and clouds can be freezing to the bone. During the night temperature drops below zero. Remember to bring warm clothes and sleeping gear. Bring a way to purify your water, especially if you go with a kerosine stove, as boiling takes ages. We had a chloride solution, which made water drinkable within half an hour. Lemon juice can be used to improve the taste. Local plastic bags are crap and prone to failure. Pack your stuff inside several bags or bring proper plastic bags from home. Tip your entourage and donate leftover food, kerosine, sacks and anything else you might not need after the trek. A tip of 200 birr is probably a good one. 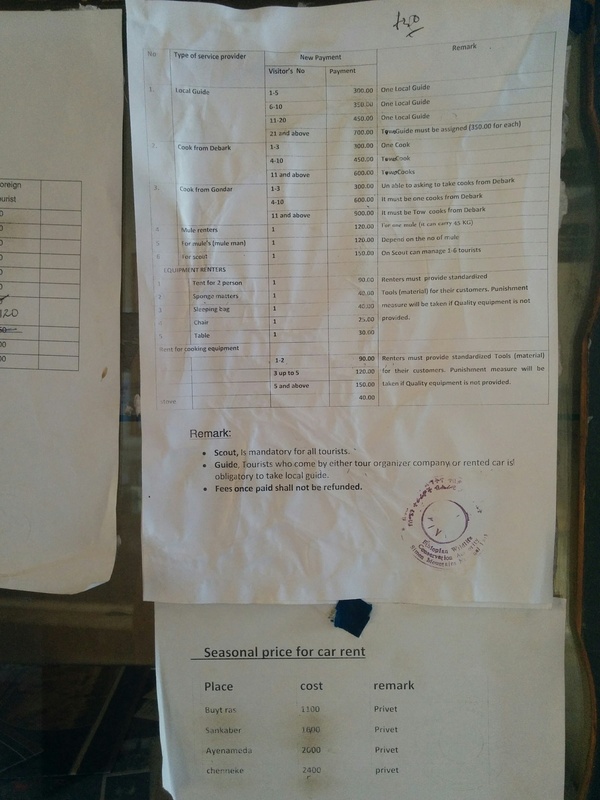 We paid around 5000birr ($230) for a two persons/three night hike that included transportation to Gonder. Organised tours go for around $250 a person. Such tours include a guide and a cook, but even with those you can organise your hike for a much better price. Happy hiking! ← How to get from Lalibela to Addis Ababa in one day. Great post!! going there next year, so this is very helfull!! Thank you for the great information!!! We are planing our trip right now. I am wondering, if you rent a mule, do you get it at debark or at the actual Park entrance, because we also consider To take a tuk tuk to buya ras Ort to sankabar and wonder what happens to the mule. Also we dont have a purifying system, can you buy water at the lodges? Thanks you very much!